JP Mokgethi-Heath speaking at the 2016 High Level Meeting on Ending AIDS Interfaith Prayer Service, June 7, 2016 at the United Nations Church Center in New York. 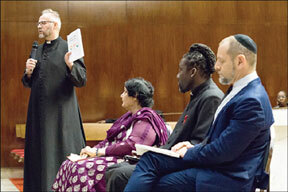 At an interfaith prayer service on June 7, people from diverse faith communities issued a call to action to end AIDS as a public health threat by 2030. The call focuses on reducing stigma and discrimination; increasing access to HIV services; defending human rights; and ensuring testing and treatment for all, including children. Rev. Phumzile Mabizela, executive director of the Inter-national Network of Religious Leaders Living with or Personally Affected by HIV or AIDS, urged her colleagues to remember that discussions about HIV and AIDS are ultimately about people, not numbers. “This is a life and death issue and we have a moral obligation to continue spreading a message of life and hope,” she said. Secular and religious leaders also joined in recognizing the expanding role of faith communities in HIV and AIDS response. Dr Azza Karam, who convenes the UN Interagency Task Force on Religion and Development, recalled the era in which the UN, as a secular entity, began to open up and see the crucial role of faith-based groups just when the AIDS epidemic was at its worst. “It is a deep irony that it took the darkness of the AIDS epidemic for the secular community to begin to appreciate the role of faith communities,” she said.